Wise is the man who takes an opportunity from favorable times, and uses the right tide for his ride. Pan Zhengmin is one of these opportunists. In the era of smartphone boom, he opened the right kind of business, and made a fortune out of it. He is the co-founder AAC Technologies, one of the most renowned electronic components companies in Shenzhen. Zhengmin graduated in 1987 from the Jiangsu Province Wujin Teacher School, and was educated to be a teacher. But teaching is not what he was made for. This was a time when the electronic gadgets were booming. Pan foresaw the scope of business in this field. 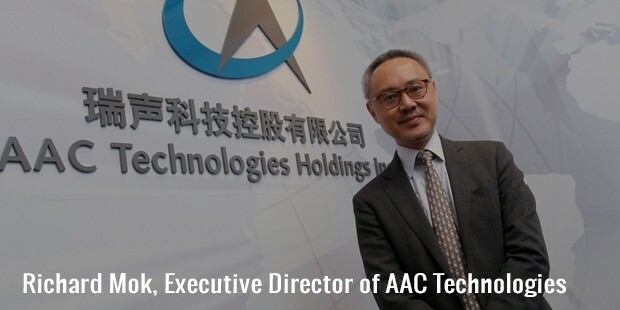 Along with his wife Ingrid Chunyuan Wu, he co-founded AAC Technologies Group in the year 1993. With AAC, he started supplying a wide range of electronic components, including speakers, microphones, antennas, receivers etc. Later, he also manufactured tablets and smartphones, including the Apple. Today, he serves as the CEO and Executive Director of the company, and is responsible for offering leadership, strategic direction and business plans for the group. He oversees coordination between development and research, marketing and sales, manufacturing and other functionalities of the company, including finance, HR and quality assurance. 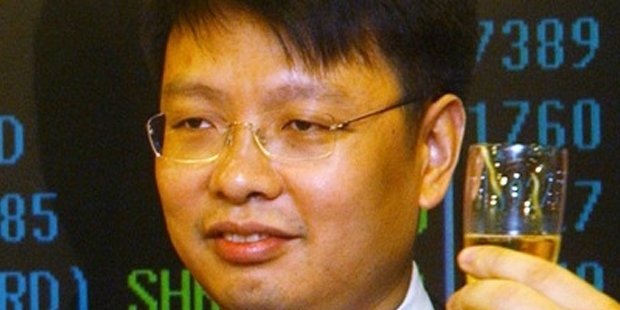 In addition to AAC, he has co-founded a few other companies, including Shenzhen Meiou and Changzhou AAC. In addition to establishing his company in China, he has made notable success outside as well. His success in other countries speaks a lot about his inherent business skills and talent. Pan co-founded and became the CEO and president of the AAC United States. With several years of experience in marketing, sales, management and manufacturing, he also heads the development and research strategies of AAC. He had developed numerous patents under his leadership, including miniature receivers, polyphonic speakers, ECM microphones, transducers etc. His wife, Ingrid, now serves as the non-executive director of AAC, and is a member of its audit committee too. Earlier, she handled everyday operations of the company, but stepped down a notch after Du Kuang Yang joined the company in 2005. She also co-founded YEC Electronics Ltd in the year 2001. Today, she is the CEO, executive director, and a significant shareholder in the company, and is director for a number of company’s subsidiaries. 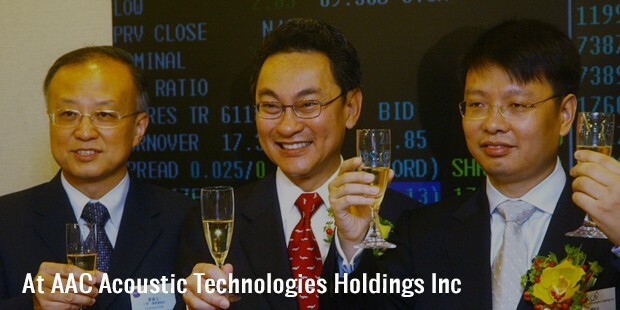 AAC was listed in Hong Kong Stock Exchange in 2005, and ever since has been one of the most successful micro components manufacturers till date. It serves as a one stop shop for all the electronic component needs, including acoustics, optics, antennas, haptics, Li-ion batteries etc. Earlier, AAC was only a dream for Pan Zhengmin, but now, it is a reality worth billions of dollars.